When vacationing in Scotland, many travellers choose to spend time in Edinburgh and Glasgow and for good reason- they are hip, fun, historical cities with lots of great culture and food. And although we spend time in and enjoy cities, our real love is discovering the countryside of our destination. Our recent trip to the Scottish Highlands took us away from the cities to smaller towns with interesting finds including the freshest of seafood, history lessons and legends, stunning vistas, and heartwarming people, and, of course, taste-testing single malt Scotch along the way! Our drive northwest from the Edinburgh airport on the road to Port Appin. After leaving the Edinburgh airport, we hop in our rental car and head northwest toward our first stop in Port Appin on Loch Linnhe. Our nine day road trip begins with a 1.5 hour drive on a major highway to the off-the-beaten-path tiny town of Balquhidder where the famous 17th-18th century outlaw and folk hero Rob Roy MacGregor is buried. Along the way, our stomachs sound off that food is in order after our quick flight across the pond and we stop for a celebratory arrival lunch. There is a charming cafe for lunch near the graveyard, just off the main route, called Mhor 84. If you find yourself perusing the menu at this delicious eatery, whatever their specials are, try them. And if they have oysters that day, eat all you can! I savored some of the best oysters (harvested that morning from a nearby loch) I have ever had in my life. I would go back just to eat those oysters again and the black pudding with fresh local scallops. After lunch, take the scenic country road to see Rob Roy MacGregor's gravesite. It is located in a beautiful wooded memorial park where surrounding shades of green and stunning vistas are abundant. Another two hours on the road and we arrive at a gentile Relais & Chateaux property in the Western Highlands called Airds Hotel. This boutique hotel overlooks sheep filled meadows, lush mountains and Loch Linnhe with its lighthouse, islands and Castle Stalker. This is a sophisticated, yet relaxed service-minded hotel with a fabulous restaurant and a tiny bar. After a fine dinner followed by local Scotch, we are off to bed. We awake to misty, but clearing, skies, which solidifies our decision to rent bicycles to take to Lismore Island for the day. A brief walk down the country lane from the hotel brings us to a nice little lady who rents bikes on the honor system. We ride our bikes to Port Appin to catch the tugboat sized ferry for our fifteen minute motor over to the island. Our weather improves immensely upon arrival so we set out to explore the ten-mile island on our bikes. With only a couple hundred human residents, the island is mainly blanketed by farms including thousands of sheep and cows. The roads are good for bicycling and the gentle slopes help us work off our future meals. As we ride in awe of the liquid blue that surrounds the island, we take in the splendor of ruined castles, tiny churches, sheep herding dogs... all indicating a primitive way of life. We rarely pass a car on the single track roads. There is one small cafe on the island and an interesting historical center with local crafts, artifacts and scores of history. The cheese plate at the cafe is the best deal and delicious. Once back on the mainland, we stop in Port Appin for a Shandy and a Guinness at the local pub/bistro called The Pier House. The food looked amazing and I would recommend trying it. This is a fun resting place to take in the local color. Off to the outstanding Isle of Skye! 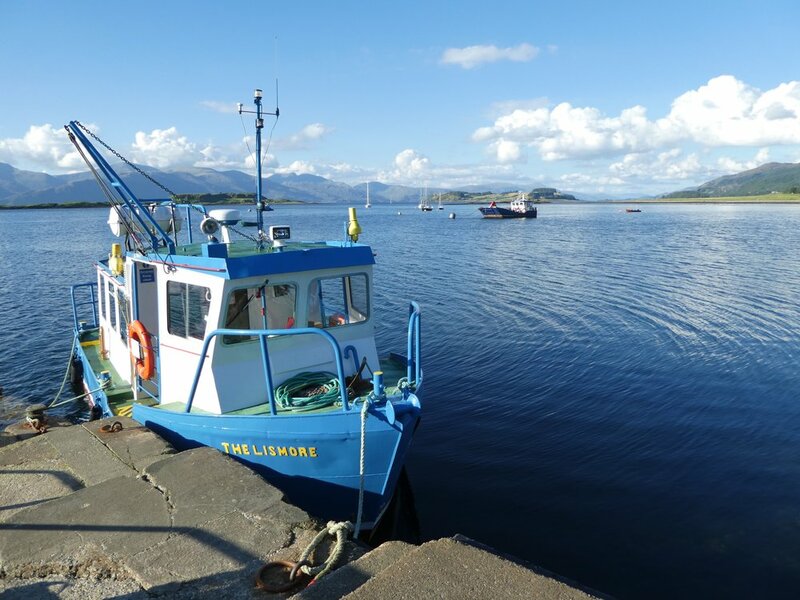 The drive is a beautiful two hour stretch along Loch Linnhe to Fort William. We choose to skip Fort William to steer clear of the throngs of tourists that stop here. After bypassing Fort William, we take the first quick left where we find a pretty route to Glenfinnan, home to the Bonnie Prince Charlie Monument and majestic views. Before the battle of Culloden, the meeting of the Clans was held here in 1745 on Loch Shiel. We climb to the top of the mountain behind the tourist center to take in long range views of the lake, the mountains and the impressive monument. Note: bring Skin-so-Soft to ward off the midges-- they will harass you otherwise! For lunch, we find the charming Glenfinnan House, a restaurant and hotel, located on the lake just a few miles down the road from the monument. This is an ideal place to kick back for a pint and enjoy an outstanding lunch. The menu is varied but expect lots of seafood and wild game. We drive an hour after lunch to catch a ferry at Mallaig to cruise to Skye. If you plan to follow this itinerary, you should definitely book your ferry reservation well in advance in high season due to the crowds. The ferry staff do a great job loading the cars and people for the forty minute journey across to Armadale. There are facilities and snacks on the ferry. After the efficient ferry unloading, we have another two hour drive on skinny single track roads (remember to stay left!) to find our luxury boutique B&B called The Spoons on Loch Snizort. Note: The Spoons converted itself to an airbnb type or "self-catering" accommodation since our stay. Marie and Ian are our amazing hosts and could not be more welcoming, helpful and generous. The outside property is gorgeous with lots of flora and fauna, and animals such as ducks, geese, sheep, and chickens. The inside of the charming home is chic and artsy, very clean, and relaxed. We loved this spot! Many of the small hamlets on Skye are a thirty-minute drive or more to the main town of Portree, so if you plan on driving at night for dinner, catch a cab or hire a driver (Marie can recommend one). In Portree there are many places to shop, drink and eat. Tonight in Portree, we have a drink at Merchant's Bar (fun) and then dine at Dulse and Brose for tapas (pretty good). Our first full day on Skye was beyond our expectations. We decide to conquer one of three peninsulas on Skye, the Trotternish. With so many sites to see in this area, we must be efficient to do it all in a day. We pass by the Man of Storr which looks interesting from the car, but is packed with tourists in the summer. You can pull off on the side of the road and take in the unusual rocky formations from below and snap decent photos. We continue counter-clockwise on the circular route on the peninsula to catch Kilt Rock which is worth a stop to hear bagpipes, take in a stunning waterfall, craggy cliffs and sweeping sea views. We arrive midday to hike the spectacular Quiraing where we spend most of our early afternoon. The beauty that surrounds us here on our hike is like no other and green, blue, purple and yellow dominate this seasonal August landscape. The colorful spectacle before us of verdant oddly-shaped mountains is dotted with yellow buttercups and deep purple colored heather while the deep blue of Raasay Channel captures the horizon. As we climb the dirt Quiraing trail up the moderate slope of the mountain, we pass people from all walks of life, languages and origins. The rock formations up ahead menacingly stare down at us. We pass waterfalls, tumbled stone, sheep (of course), creeks and more greenscapes. The famous "Prison" rock formation is up ahead and worth a visit. Give yourself plenty of time at the Quiraing as it is vast with many hiking options. The main trail is a few hour loop, but we double backed on our trail after a good hour. We found it to be an ideal place to pull up a rock and feel gratitude for being able to experience such a breathtaking, wild world of beauty. After the Quiraing, we continue on our peninsula loop and stop for a chili hot chocolate break at the Farm Stand which is at the end of the peninsula. They serve soup and sandwiches too, but today we are taking off from having lunch to allow our tummies rest until dinner. Our drive continues around the peninsula passing through quaint hamlets, the large town of Uig and many viewing points of the other peninsulas, islands and the sea. It is a spectacular drive. The sight of the ocean never leaves your view. We find Fairy Glen which reminds us of stepping into the filming of the Hobbit. Exaggerated lumpy, conical hills are what makes this site unique. If you close your eyes, and open your mind, you can almost picture fairies dancing around. It is a quiet place for a picnic, hide and seek, or a nap! Tonight is a special dinner at The Three Chimneys, the 2018 UK Restaurant of the Year by the Good Food Guide. It is upscale and somewhat pretentious, but well worth it once you taste the food. 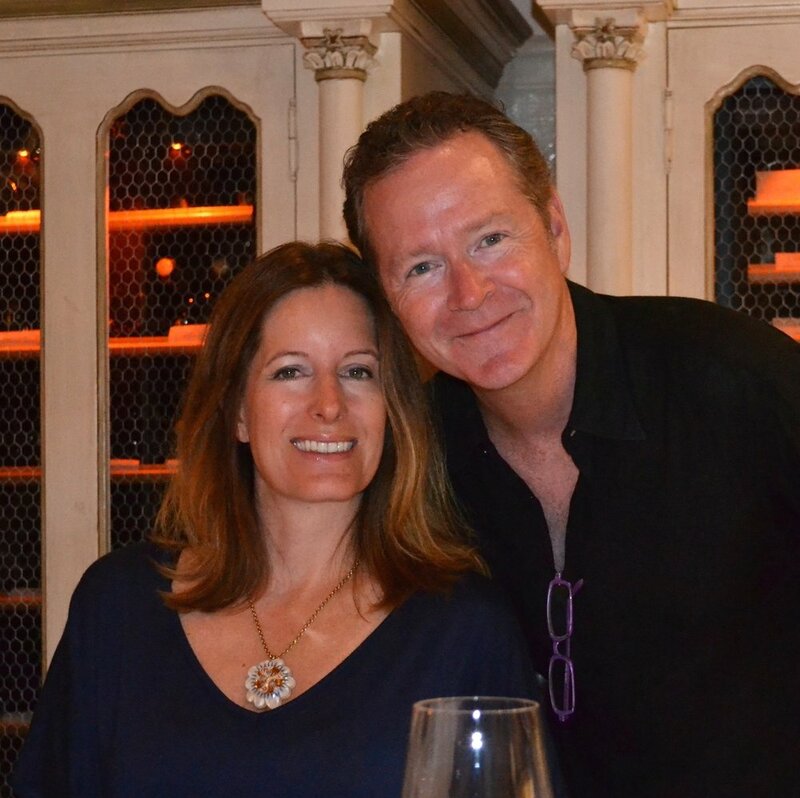 The wine list is stellar and the three course prix-fixe menu of local ingredients with creative culinary twists is something to be revered. We wonder if three courses will be enough, but not to worry for with our courses comes a starter of canapés, an amuse bouche, and then prior to dessert a pre-dessert. The after dinner scotch tasting is educational and delicious. Today is dedicated to taking in the Fairy Pools and sipping scotch at Talisker Distillery. The weather is chilly for late August and it is a bit "blowy" as the locals say. It is raining off and on, so we dress in our woolies and rain gear. It is a good hour drive from the Spoons to Glen Brittle where the Fairy Pools are located. The giant Cuillin Mountains darkly hover over the area. And although there are lots of people, the area is vast and doesn't feel crowded. 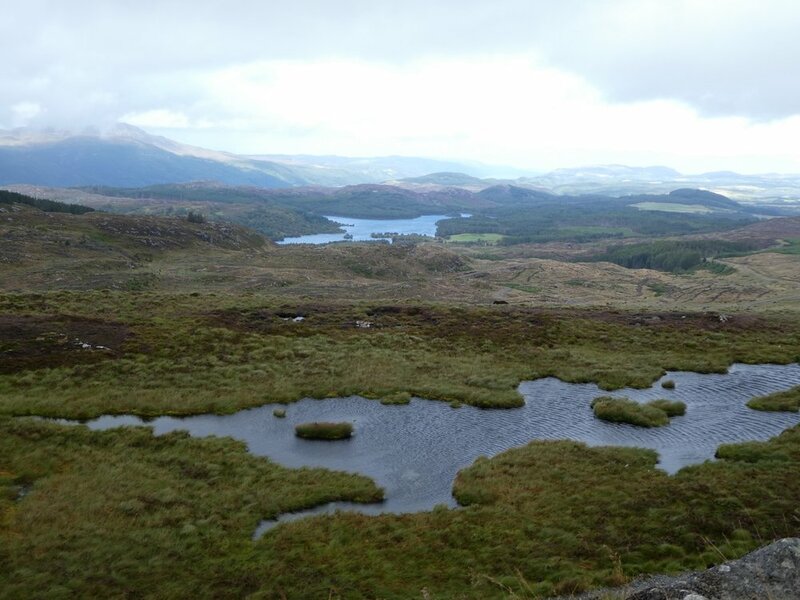 To get to the Pools you follow a single hiking trail through fields of heather and a flowing river. As we slowly ascend towards the pools, we pass numerous waterfalls. The "Pools" are essentially pools of crystal clear water like natural bathtubs teeming with fish and colorful rocks. The hike is a good workout, but not too strenuous. With the chilly temperatures though today, we decide after an hour of hiking, we better turn back and move on to Talisker Distillery to taste some Scotch and warm up! Before our Scotch tasting, we find an oyster lunch at the Oyster Shed in Carbost. The oysters are good, but nowhere near as good as Mhor 84's. Luckily Talisker is only a couple minutes away since we are getting a little tired after our big morning. Being that it is late August, the area does have its share of tourists just like us, and Talisker probably was the most touristy place we found. The Scotch was worthy of a try, but we found the tasting room to be too commercial and the Scotch too peaty for our tastes. Later for dinner, our hired driver takes us to the Edinbane Inn for dinner and a "cailee". A cailee is a local group of musicians getting together to play music with violins, guitars, bongos, tambourines, sticks or whatever is available. Imagine lots of energetic clapping, toe tapping and lively fun. The Edinbane oozes with local character. Heading north today to Inverness! We are sad to leave Skye as it is otherworldly with so much to do. Before leaving the island and our journey north, we stop at Skyeskyns in Stein (pronounced steen). 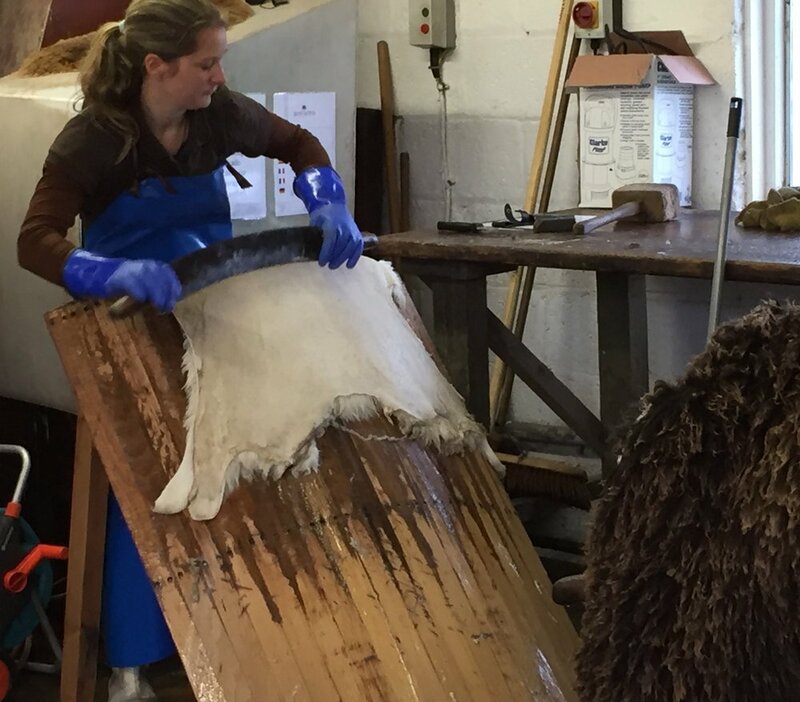 This is a worthy stop to see the process of preserving the hides of the sheep for repurposing. Since mutton is the number one form of protein eaten by the Scots, it would be a waste to throw away the hides. SkyeSkyns is one of two remaining hand manufacturers of sellable skin. They give you a free twenty minute tour of their small factory (think two rooms) and then take you to their charming showroom. A lot of care goes into making the skins. We found many skins we liked at great prices and thank goodness they ship! After you visit SkyeSkyns, stop into the Stein Inn for a peek inside the oldest inn on the island. North we go, across the Skye Bridge (instead of the ferry) and onto the mainland up to Kishorn to find lunch at the Kishorn Seafood Cafe. It takes us about 1.5 hours on a good local road along the coast. Kishorn, in the middle of nowhere, is the best stopping point on the way to Inverness from Skye. At the cafe, you can expect a bevy of seafood options, but most notably the oysters (to die for) and squat lobsters (in season) which are sweet little morsels that mimic the look of crawfish. The place was busy with a diverse lunch crowd for a good reason. As we continue on our trek north to Inverness, we take in the beauty of the Highlands with its waterfalls, green glens, gigantic sweeping mountains, craggy cliffs, and sheep, sheep and more sheep. We pull into the largest town we've visited so far on the trip, Inverness, which is more like a small city, just in time to beat rush hour. We locate our next boutique hotel called Rocpool Reserve. It is a modern hotel with larger rooms, nice appointments, and an excellent restaurant. It is on the outskirts of town, but still walkable to the city center. Inverness has lots of history and sits on the River Ness. Normally Inverness would be too busy of a city for our liking, but it is smack dab in the middle of our touring itinerary which includes scotch tastings at the distilleries just north of Inverness, a visit to Loch Ness to our south, and Clava Cairns and Culloden Battlefield to our east. We hire George Munroe with Around Loch Ness Tours to guide us on our way today. He is local and knows the area inside and out. His comfortable touring van was perfect for our nine hour day tour. First we start by touring around the lake eventually finding ourselves at Urquhart Castle. It is no wonder the castle is in ruins after learning its tumultuous and violent history. The views of Ness are spectacular (however, no Loch Ness Monster in site this day! ), but if you don't like crowds, pass on this stop. A must do is a stop at Foyer Falls to find a beautiful wooded walk down to a gigantic 165 foot secluded waterfall. You can take in the flora of Blue Heather, hazelnut trees, Caledonian Pines, Rowan Trees and lots of evergreens. This is definitely a secret spot and if it wasn't for George, we would have missed it. We all loved it and the nature was stunning. Just before the entrance to the Falls, is an ancient cemetery where fans of Outlander can see a whole slew of Fraser headstones. If you like cemeteries, this one is a rare find. Afterwards, make your way through Upper Foyer to a quaint cafe called The Camerons. Just outside of the cafe rest gigantic Highland cows and Roe Deer. Inside the cafe, you'll find a casual, healthy menu. The caramel pudding is a must-have for dessert (okay not so healthy)! There are a lot of great hikes to find in this area and after lunch, George took us to one with a 360 degree view of forested mountains and lakes. It was another awe-inspiring stop. After a visit to the spiritual and historical Clava Cairns, we head to Culloden Battlefield. This place is the exact opposite of spiritual. You can almost feel the pain and sacrifice left on this vast battlefield. The fact that it is a cold and blustery day doesn't help either. The history of this place runs deep and it's well worth a visit, especially if you have Scottish heritage. It helps to have a guide and/or good knowledge of the history of the Jacobites and their fierce battle with the English. The day with George was excellent and we learned a lot. We are tired though and ready for a drink at our Rocpool bar! We have dinner at the swanky Chez Roux (reservations required) at our hotel. The cheese soufflé is a must to try! Off to taste Scotch! The first tasting is at Glenmorangie. This is a much quieter place than Talisker and has a beautiful tasting room. We thoroughly enjoy their scotch, too. Afterwards, we drive a little further north to visit the adorable town of Dornoch on the way. Here you can find lots of shops, cafes and cobblestone streets. Eat lunch at Luigi's if you're looking for an elevated experience other than pub food. After lunch, we drive just a short ways north to our next distillery stop, Dalmore. A much smaller tasting room than Glenmorangie, Dalmore is cozy with excellent scotch. We all had a hard time choosing which single malt whiskey of theirs we liked best, but the 12-year-old King Alexander may have won out. Tonight, prior to dinner, we visit the Black Isle Pub in Inverness which has over 50 craft brews to choose from. It is a bountiful tasting and the place is quite lively. For dinner, we dine at The River House and once again have local oysters that are very creamy and flavorful! You will find the freshest of seafood at this restaurant. Everything we ate from the scallops to the crab to the fish was superb. Post dinner, we stop by Hootenanny for live local music. Time to go home back to The States. Boo! We loved this trip so much. There was not one stop we would remove from this itinerary. It was off the beaten path to some degree, but every location was a unique exploration and had lots of interest. We look forward to going back one day to take on the North Coast 500 followed by a visit to the Orkney Isles. Until then, eat, drink and be merry.